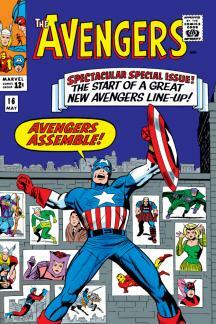 The Avengers undergo a metamorphosis courtesy of Jack and Stan Lee! Join us to celebrate Jack “King” Kirby’s 100th birthday by learning about the characters and stories he created that changed comics forever. To commemorate Jack’s centennial, we’ve sat down with the modern-day creators he influenced—and the decades of work he gifted us all. Right off the bat, Stan Lee and Jack Kirby made it a point to keep AVENGERS readers on their toes by first introducing Hulk as a member of the team and then having him leave one issue later. With the fourth installment, they brought in another hero by the name of Captain America after finding him floating in a huge ice cube in the ocean. 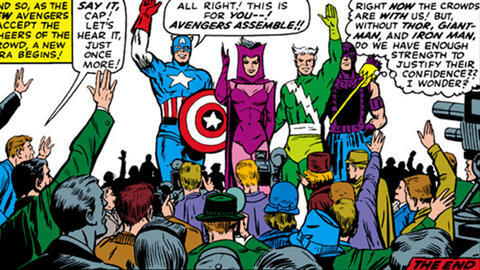 However, with 1965’s AVENGERS #16 they pulled off one of the greatest team transitions in history as all of the remaining original Earth’s Mightiest Heroes took off and the Sentinel of Liberty carried on—with a bunch of people assumed to be criminals by the general public! The story began like many others with Thor, Iron Man, Wasp and Giant Man facing off against the Masters of Evil in the streets, weighing their options on whether they should jump immediately into the fray or hang back to keep the onlookers safe. The Melter, Enchantress, Executioner, and Black Knight cared not for the safety of others and attacked the heroes. In the process, the two Asgardians decided to cut and run, leaving Melter and Black Knight to the Avengers’ mercy. Meanwhile, Captain America and Rick Jones cleaned up the previous issue’s adventure that led to the apparent death of Baron Zemo. Back at Avengers Mansion, Iron Man, Wasp, and Giant Man sat down to discuss the concerns of the day. Janet Van Dyne came right out and suggested that they all step back from the team and take a break. That conversation got put on hold when they saw smoke rising in their headquarters. The crew soon found its source: Hawkeye! The masked archer quickly stated his desire not to fight with the Avengers, but instead alongside them! Clint Barton got the nod after shooting off the ropes that he himself had tied Jarvis up with. The remaining Avengers did their best to catch Hawkeye up to speed while also attempting to bolster their ranks. Namor passed on the opportunity, but the publicity garnered the attention of former Brotherhood of Evil Mutants members Scarlet Witch and Quicksilver who decided to make their way to America. After publicly announcing their newest member in the now-Avenging Archer, Earth’s Mightiest met with the Maximoffs while Captain America and Rick continued their long journey home and Thor remained in Asgard. By the time Cap finally got back to the mansion, he found himself looking at a room half-filled with strangers. Understandably surprised by all of the changes, Steve Rogers decided to stick around and lead this new group that would soon become known as Cap’s Kooky Quartet! More importantly, these three would go on to become among the most beloved and important Avengers of all time and it all came from a huge shake-up that could have been as disastrous as it was successful.